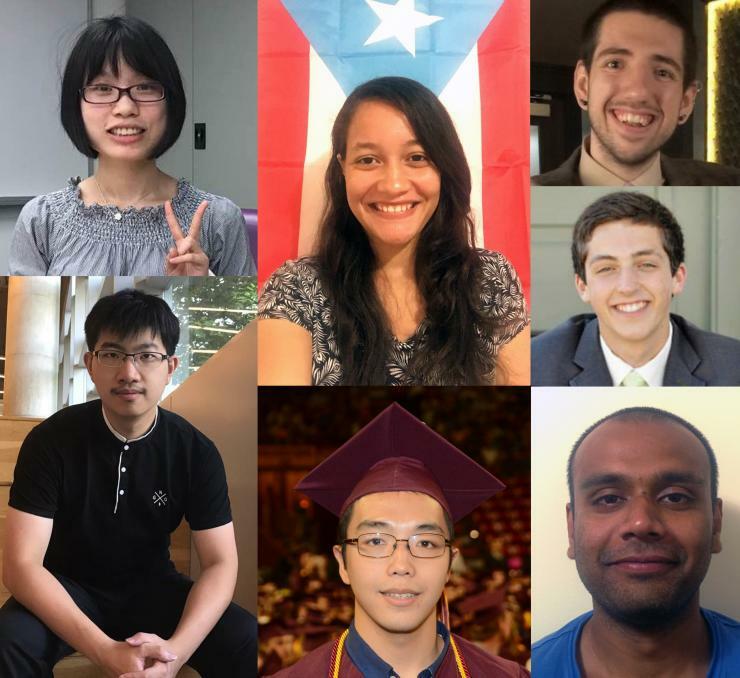 Meet the second cohort of QBios Ph.D. students: (clockwise from top left) Mengshi Zhang, Kelimar Diaz Cruz, Daniel Muratore, Brandon Pratt, Akash Vardhan, Guanlin Li, and Kai Tong. Seven students have joined the Interdisciplinary Ph.D. program in Quantitative Biosciences (QBioS). These students have backgrounds in physics, mathematics and biology and join the program from the United States, China, and India. Altogether, the QBioS Ph.D. program now includes 16 students, including nine members from the inaugural cohort who joined in Fall 2016. The QBioS Ph.D. is directed by Biological Sciences Professor Joshua S. Weitz. The QBioS Ph.D. was established in 2015 and includes more than 50 program faculty. The mission of QBIoS is to educate students and advance research, enabling the discovery of scientific principles underlying the dynamics, structure, and function of living systems at scales from molecules to ecosystems. Of the seven incoming students, four are affiliated with the School of Biological Sciences and three are affiliated with the School of Physics. Brandon Pratt graduated from the University of Washington earlier this year, receiving Bachelor of Science degrees in neurobiology and in molecular, cellular, and developmental biology. He notes, “I was drawn to the PhD program in Quantitative Biosciences at Georgia Tech because of its unique design that bridges the gap between biosciences and engineering. Coming from a primarily biosciences background, this program allows me to expand my repertoire of technical skills and knowledge to include those from the fields of computer science and engineering. I aim to use these skills to better describe living systems, particularly neural systems.” Pratt intends to conduct research involving how sensory information is acquired, processed, and integrated in the nervous system. Mengshi Zhang received her B.S. in Biotechnology from South University of Science and Technology of China in 2015 and then switched to the Department of Physics at the Chinese University of Hong Kong for her master’s degree (MPhil), graduating earlier this year. She is fascinated by the quantitative descriptions of biological phenomena and drawn to this interface in QBioS. Zhang has backgrounds in system biology and synthetic biology, and experience in wet and dry labs. “I would like to combine both computational analysis and experimental methods and look forward to integrating principles of physical, mathematical and biological science together within QBioS,” she says.